← Quick, Detour To The Park! 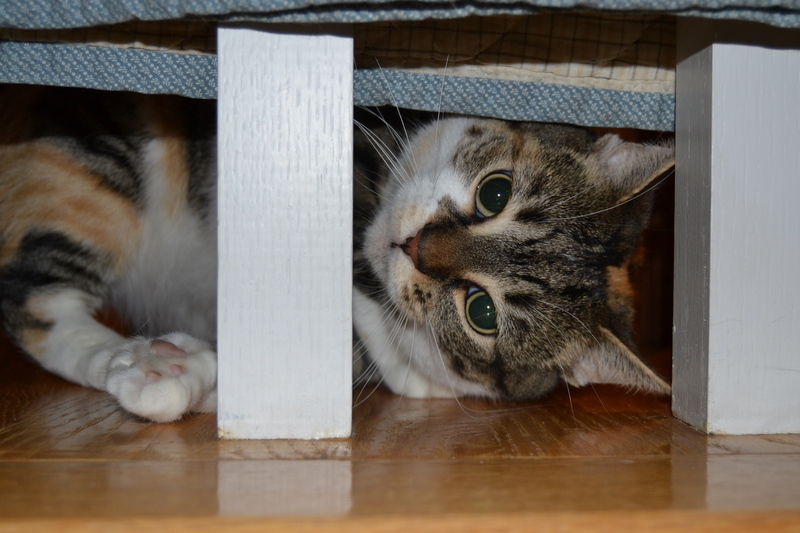 This entry was posted in Days at Home, Sundae and tagged bannister, calico cat, old quilt. Bookmark the permalink. 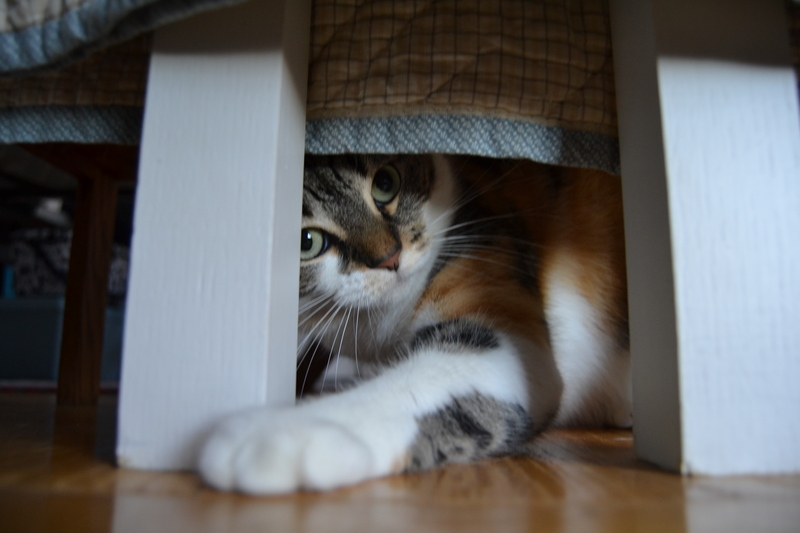 Hmm….well, first of all, Sundae looks like she’s having some fun in her new playground – she’s such a beautiful cat! I’d say “cattitude” fits that last photo purrfectly (so does Sam). What a great play area! 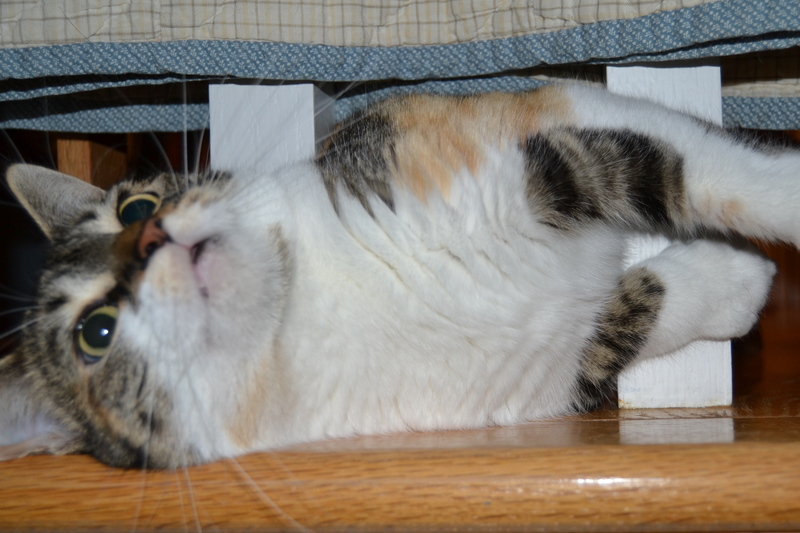 Sundae is so fun to watch in your photos! She reminds me of BJ when she was ‘vacationing’ with you and you sent me a picture of her playing around that same area! It really attracts our kitties! As the kids scritched Zena, our guest lab, over the holidays…goodness, it was funny…she looked like she was running in place laying down sideways. They sure can become become active in the most sedentary ways. I love all these clear, sharp photos. 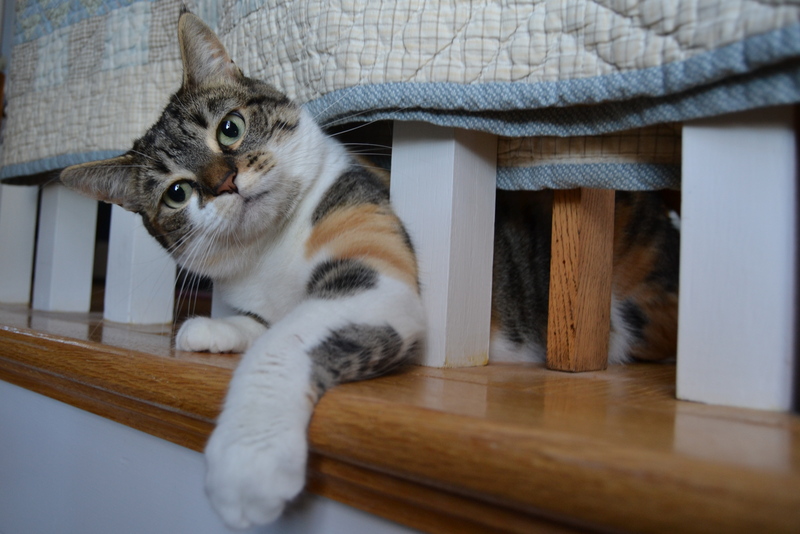 What a beautiful calico coat Sundae has. You can tell her the rest…but the part about the beautiful coat might give her a big head and I would hate to see her not get her head through those rails. Sundae is a comedian, star and a furry beauty. What better way to spend the day. She can’t wait until the royalties start rolling in. I like Marshall’s choice…it is kind of a freaky shot of Sundae….sort of Alice in Wonderland-ish. Diane, she is so cute!! Those are all great pics, especially the one that Marshall likes best! Wasss up? Talk to the paw! she is such a mess! don’t get stuck, little girl! 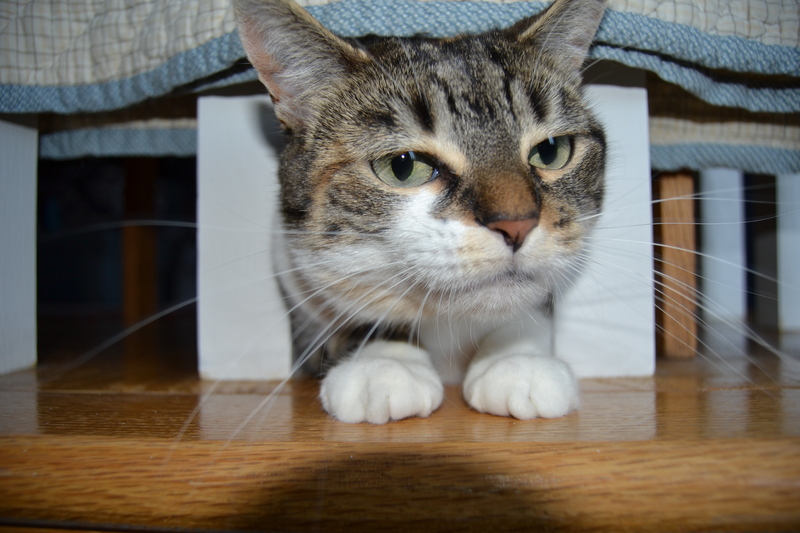 Great pictures of beautiful Sundae. She is indeed playful. Marshall’s favorite is my favorite. So cute. Looks like she is ready to pounce. These are adorable! Does Sundae pop out and surprise you? Cause I’m pretty sure that would scare me!!! Fun combo of action and “posed” shots! The “head & paws” shot reminded me of some sort of toy from years ago, but internet research hasn’t yielded anything up just yet .. Maybe it’s a “Cheshire cat” sort of thing ; just a face and paws?? She was having a blast that morning !! Sundae always take the cake for me! I love these posts about Sundae!! Such a perfect place to play with you. For some reasons, my kittens have started coming to the back porch; last night they slept in the RTV. They’ve grown to be almost as big as their mommy; but I can’t hold them! She looks like she’s quite enjoying her “spot” by the quilt. Great shots. Sundae looks like a sassy cat! I’m jealous of the banister – that looks like fun. Wanna trade it for some great cardboard boxes??? I just want to smooch Sundae’s face! That Fuzz Face was smart to adopt you. Those pictures are just *priceless*!! Such a face! Marshalls favorite pic reminds me of the floating head of the cheshire cat in the newest version of Alice in Wonderland…love it! BTW Sundae is beautiful!